and where I found it. I have a piece of one of the frosted glass windows! Is this foto prior to Spahn owning the ranch? He let the ranch run down. The hay day of Spahn's movie ranch was before he bought it in 48. Notice the big boulders are gone which were there in 61 to keep cars from running up onto the boardwalk. In that foto George Spahn's house has not been built yet. I don't think Spahn pushed the ranch as a movie ranch. he was over 60 when he bought it. I suspect that photo is from a movie prior to George owning the ranch. Look at the chaps the cowboy is wearing. They predate the 1950s Westerns. Spahn bought the ranch in 48. The Spahn Ranch was too rundown to use when george bought it. There were union rules that gave a lot of business to the many ranches within the 35 mile radius around Hollywood. Outside 35 miles the cast go extra pay. Spahn ranch was well within the 35 mile range but got little business. If Spahn had been young enough to keep up the ranch it never would have descended into such a state as to accomodate a band of lazy hippies. I'm not bashing George for his eyes and health prevented him from maintaining the ranch in movie form. George was taken advantage of in his declining years. This happens quite alot. Con Men love to pick on the elderly. George earned his living renting campsites and horse rides. Horses cost money. Property taxes were killing George. In a way you can say that high property taxes caused TLB. Either George let the Family stay at his ranch or the county would forclose. 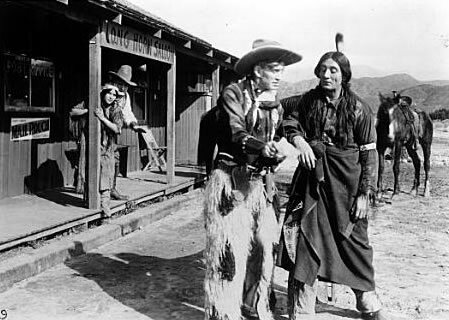 That actor looks like the same guy who played Chief Wild Eagle on F Troop!